Road Condition: Bumpy dirt road. 2WD accessible. Parking: Average sized lot. Almost empty. Campsite Availability: Some flat spots on top of ridge. Private Property: Entire ridge is on private property so please be respectful. 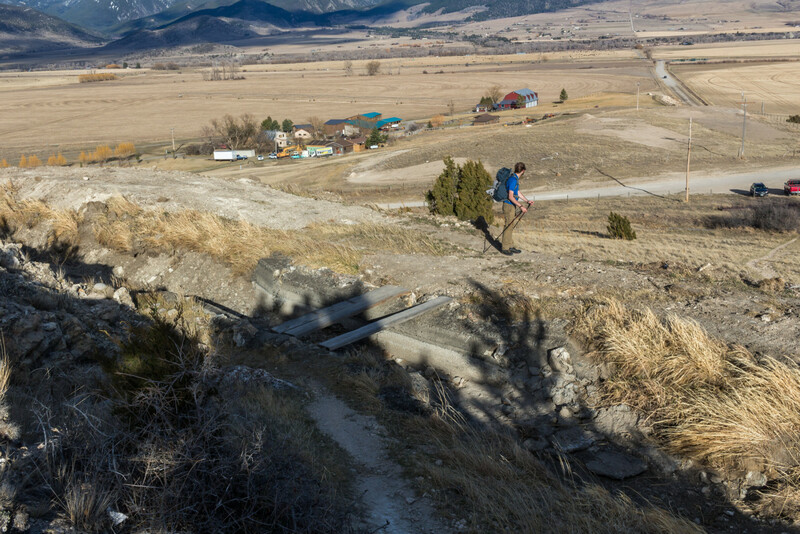 Trail Features: Ridge hike. 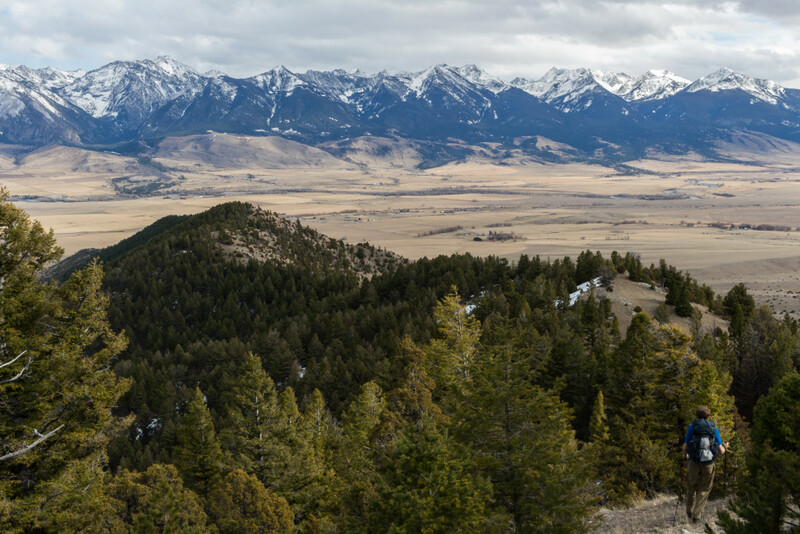 Views of Paradise Valley, Absarokas, and West Pine. Trail Condition: Fairly well-established. Unclear in some spots but obvious where to go. Snow: Some patches on top especially on north side. Winter Access: Probably. Spikes or snowshoes recommended. Weather: 40's. Partly cloudy. Very windy. Sporadic. Minor snowfall. 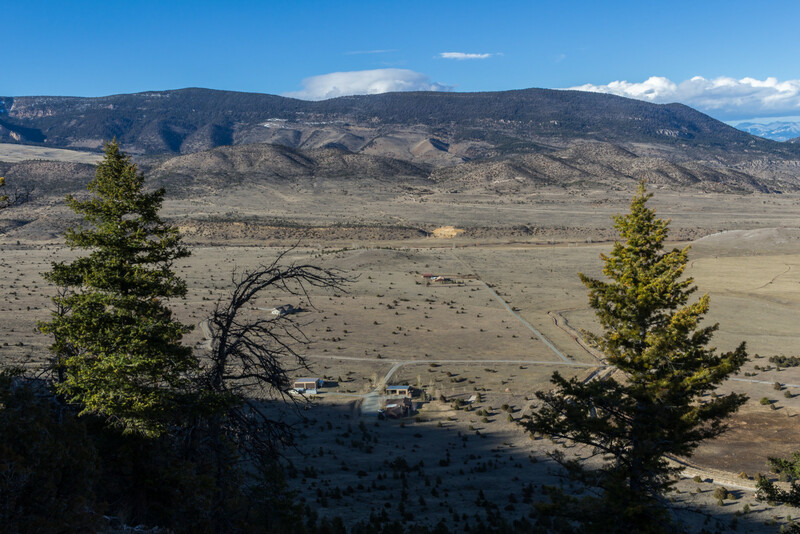 The Hogback is a four mile long “hogback” ridge running east-west in the northwestern corner of Paradise Valley, about 10 miles south of Livingston, and can be easily accessed by a parking lot only a couple of miles to the west of Highway 89. 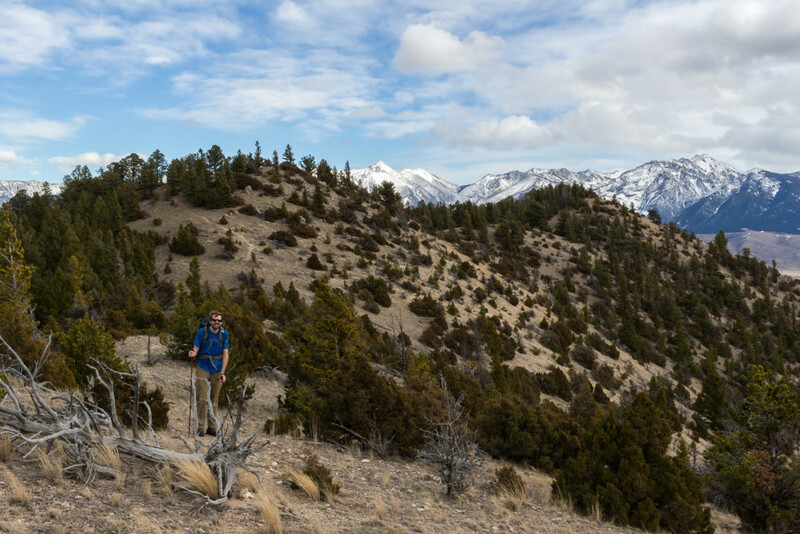 The trail starts at 4800′ as a steep, switchback-free climb up the east end of the ridge before leveling out and following a series of humps until peaking at about 6500′. 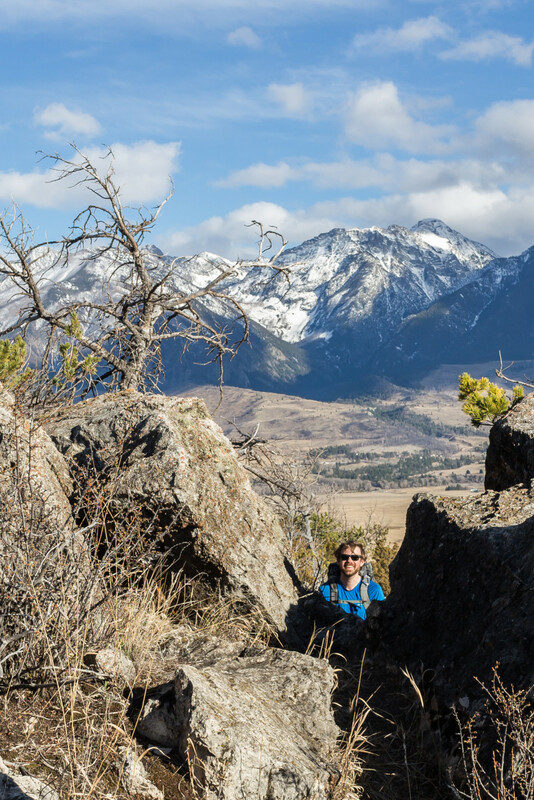 Being that there’s no real “end” to the trail it can be customized to your liking or ability and the views of Paradise Valley and surrounding mountains are just fantastic regardless of how far you go. 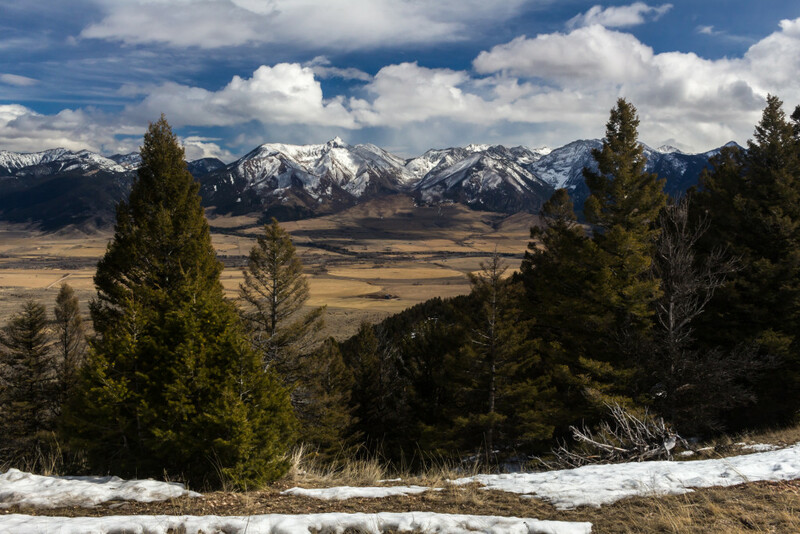 It melts out fairly early making it ideal for springtime hiking if you’re willing to drive a little extra distance and there’s probably descent winter access as well. All in all it’s a really fun hike appropriate for all skill levels with plenty of revisit value. March marks the transitionary period between winter and spring that so many people look forward to. The feeling of imprisonment dissolves as warmer temperatures pulverize the snow and sounds of spring fill the air. Moods become more cheery and increased daylight allows you to pack more adventure into a single outing. But don’t be fooled, hiking season is far from mature. 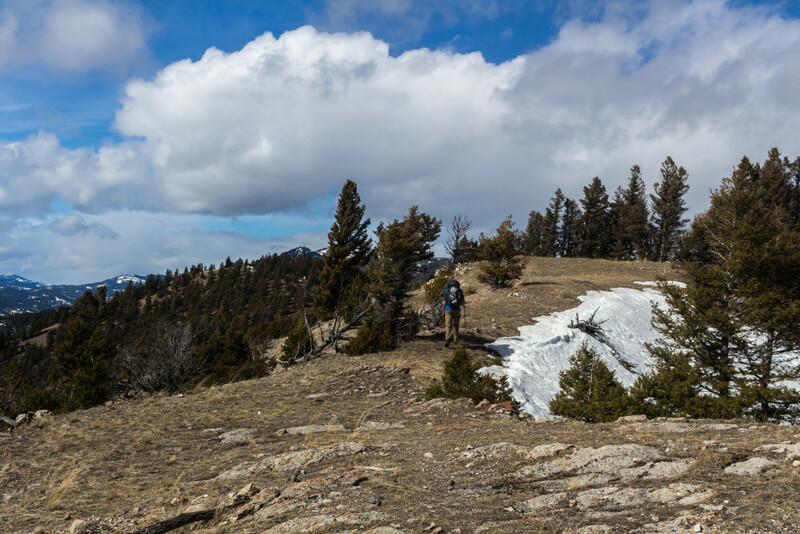 While many shorter, low-elevation hikes melt out quick, winter still persists in the backcountry which rules out most of the interesting places. There are two options for dealing with this: hike the same, over-populated trails repeatedly or get creative and discover something new. 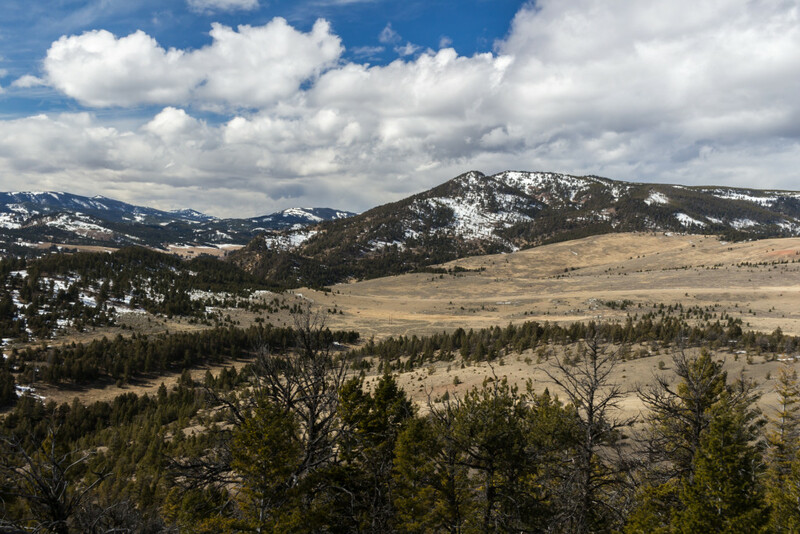 It was the motivation to find something new that lead me to Hogback Ridge which I now believe to be the quintessential springtime hike. 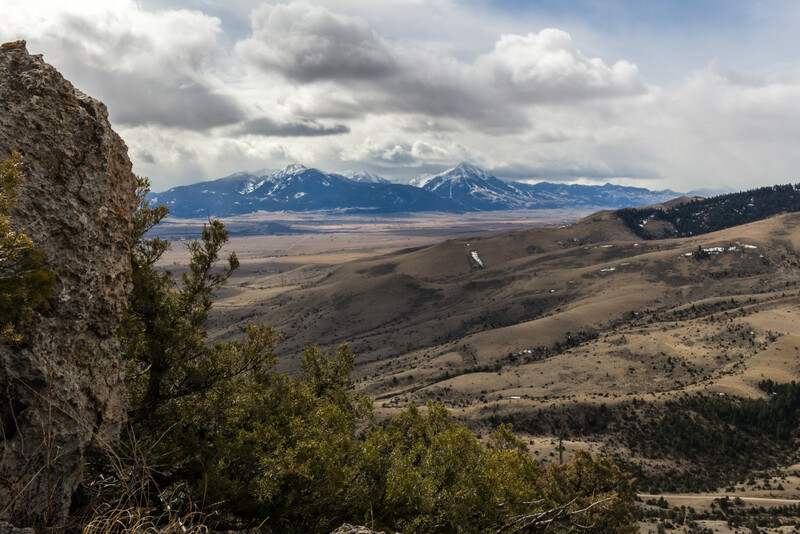 The Hogback is a 4 mile long “hogback” ridge running east-west in the northwestern corner of Paradise Valley, about 10 miles south of Livingston, and can be easily accessed by a parking lot only a couple of miles to the west of Highway 89. 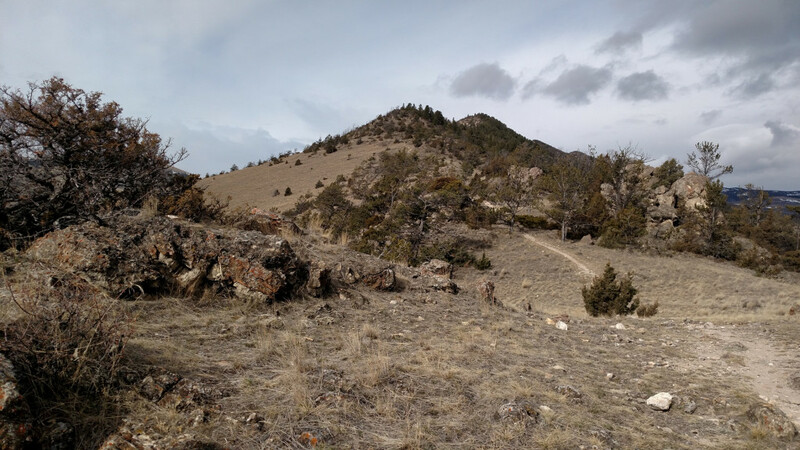 It starts at 4800′ as a steep, switchback-free climb up the east end of the ridge before leveling out and following a series of humps until peaking at about 6500′. Being that there’s no real “end” to the trail it can be customized to your liking and ability. It’s also a supposed hot spot for hang gliding if that’s your thing. More information on hang gliding here. 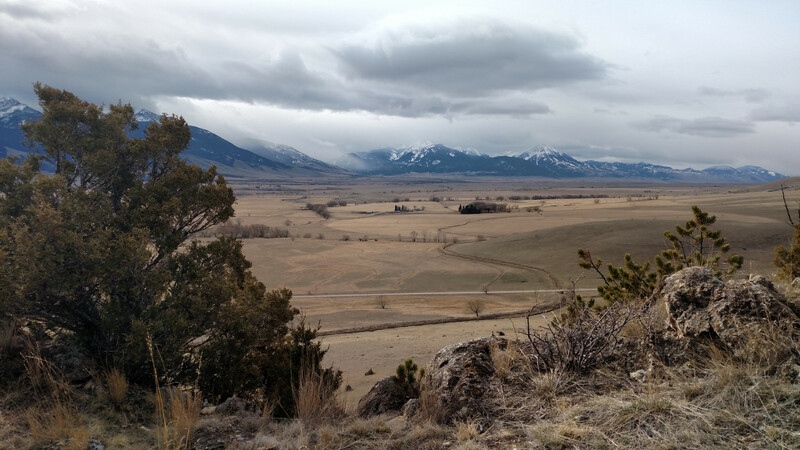 Two ideas were in mind as I drove over to Arlo’s pad: Hogback Ridge or Chestnut Mountain. 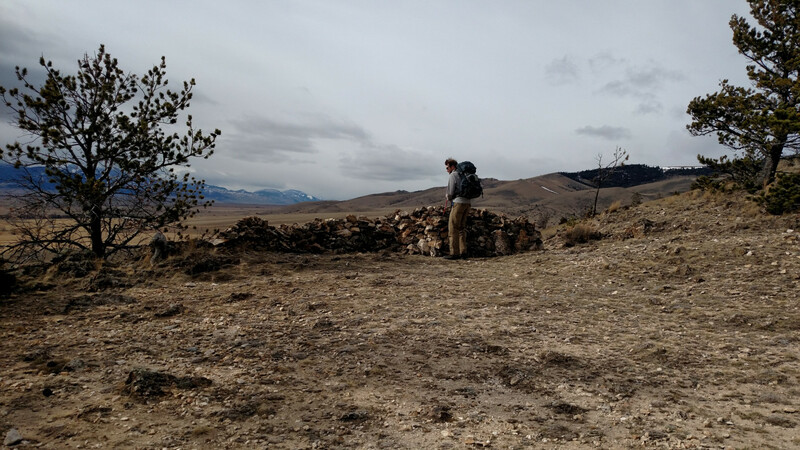 We’d been putting off Chestnut for a while now, saving it for a rainy day, but I was much more interested in The Hogback which, based on my research, was an iconic hike of the Livingston area with great springtime access. As Arlo packed his things into the vehicle he asked “So Chestnut then?” in a dry, unexcited tone. Not terribly excited about Chestnut myself I threw together a quick sales pitch and quickly had him sold on The Hogback. It’s a simple 45 minute drive to the trailhead regardless of the route. You can take Interstate-90 to Livingston for better driving conditions or Trail Creek Road which is more scenic but partially dirt. The weather certainly added some drama to things. To the east it was sunny, to the west it was overcast, and Paradise Valley itself looked safe but the surrounding mountains were full of tumultuous, snow-bearing clouds ready to inflict harm in a moment’s notice. I only had three words: Bring it on. As we arrived at the trailhead I was shocked to again see no other cars in the lot. How was this possible for such a prime springtime trail? Probably daylight savings time laziness. Whatever the reason was, it didn’t matter, aside for an older guy who appeared shortly after our arrival the ridge was ours. Tumultuous, snow-bearing clouds as seen from the parking lot. I was nearly swept off my feet by the powerful wind as we departed the lot and made our way towards the trailhead. The ridge is on private property and a large fence surrounds the perimeter. We had to squeeze through a narrow opening in the fence to get to the trail which immediately heads up the east face of the ridge. Someone put some effort into that wall. 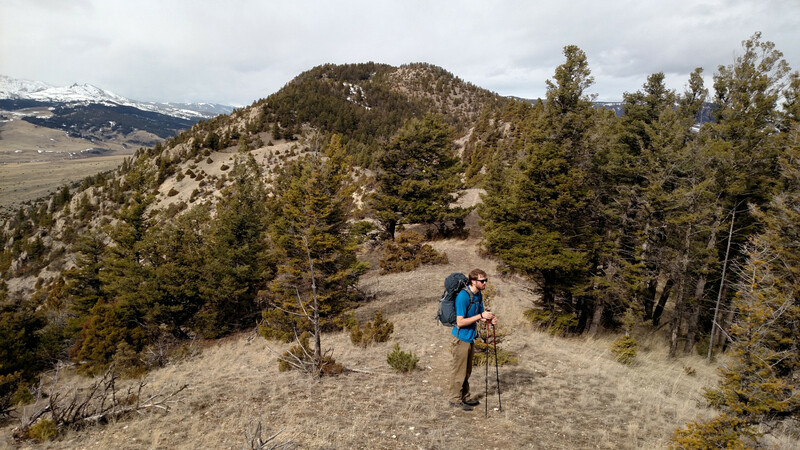 The trail climbs about 1500’ over the course of the first 2 miles at which point the ridge begins to flatten out. A beginner might struggle a bit with the first section since there’re no switchbacks but it really isn’t that bad and there’re plenty of adequate break spots along the way. There’s even a picnic table about 0.5 miles up. First sights of the hog’s back. There are incredible 360 degree views of Paradise Valley at the top of the ridge. 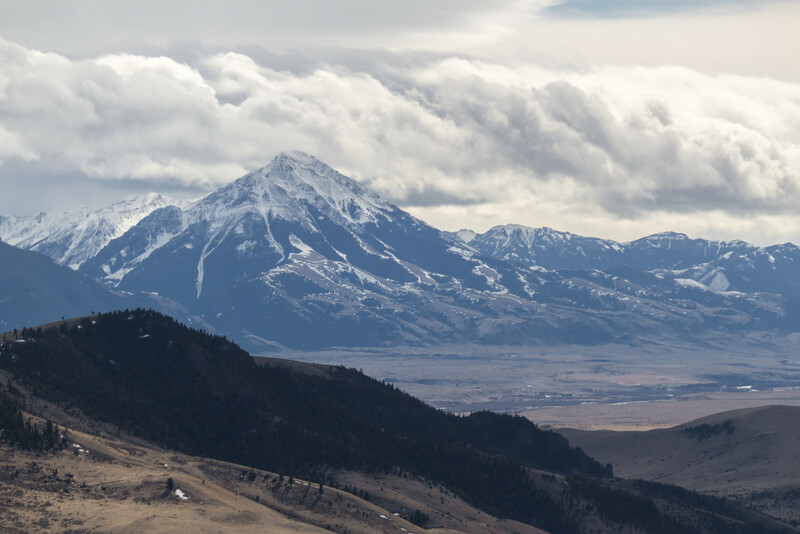 The Absaroka’s to the east are just stunning this time of year and the massive Emigrant Peak, a popular hiking destination and backcountry ski hotspot, towers in the distance to the south. 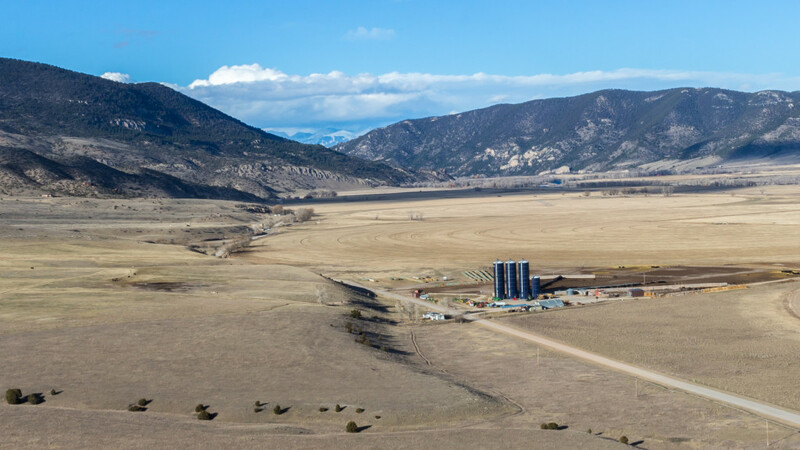 Canadian-based mining company Lucky Minerals Inc. has recently proposed drilling in the nearby Emigrant Gulch which has sparked anger among locals and outdoor enthusiasts. 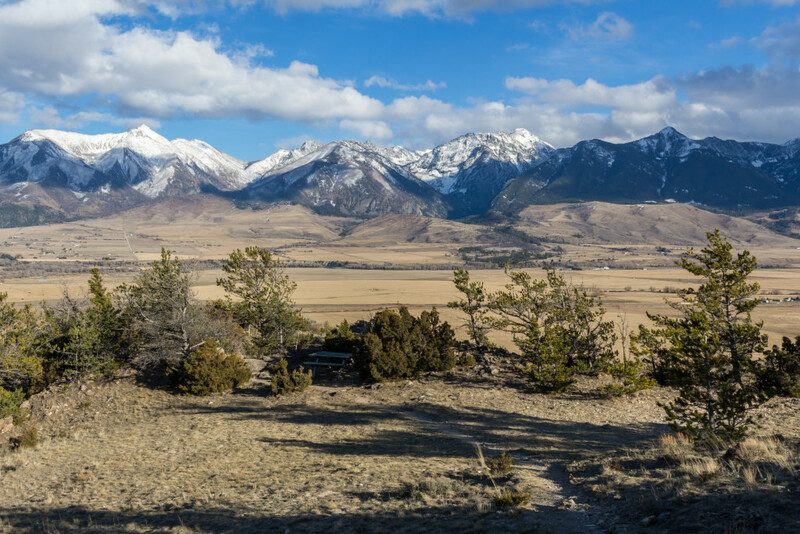 Although these plans are in their infancy many opponents of the idea have taken action to prevent the mine as well as any mining in the Greater Yellowstone ecosystem. The trail continues onward following a seemingly endless series of humps. We had no idea how far the trail went so we just kept going, expecting it would terminate at some point. But every time we made it to a high spot there was another hump waiting up ahead. It actually turned out to pretty fun hopping from hump to hump. 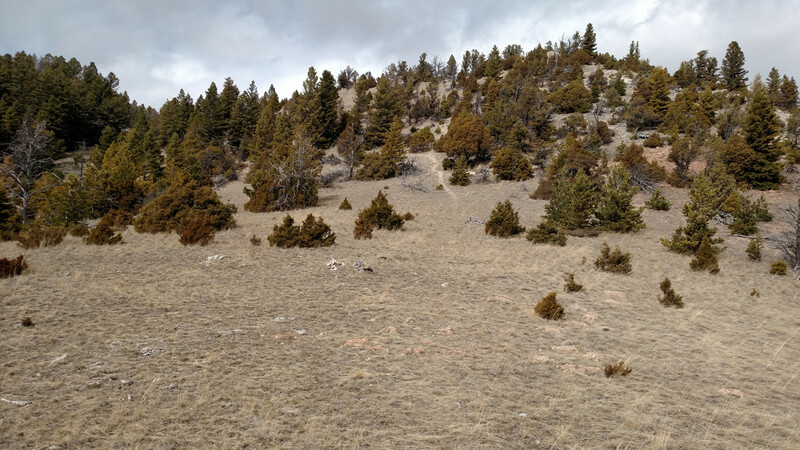 On a real mountain ridge landmarks are usually farther away or larger than they appear so what may look like a short distance could be miles long but on a smaller-scale ridge like the Hogback you’re perception isn’t so distorted and progress can be felt. 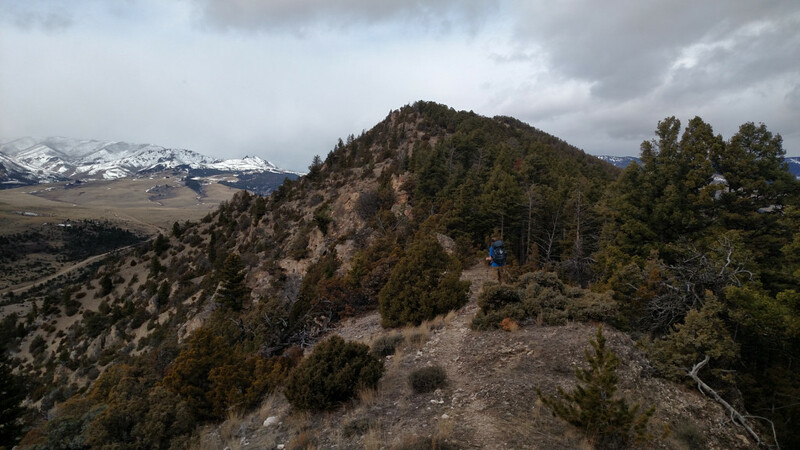 At times the trail becomes unclear as it navigates around some “treacherous” areas but it’s easy to stay on the top of the ridge if you don’t mind climbing up and down a few rock sections which add to the fun anyways. It was inspiring to observe the weather progress throughout the day. 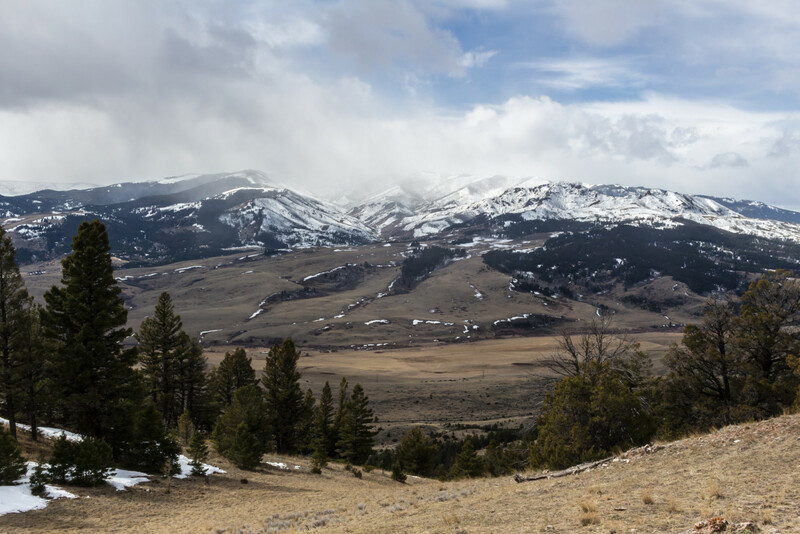 Storms continuously blew in and out of the valley but the weather around the ridge was, for the most part, quite pleasant, aside from the occasional snowflake and the howling wind which refused to let up. The clouds were just thin enough to allow the sun to cast a faint glow over the region, accentuating the already dry and lifeless look of the terrain. 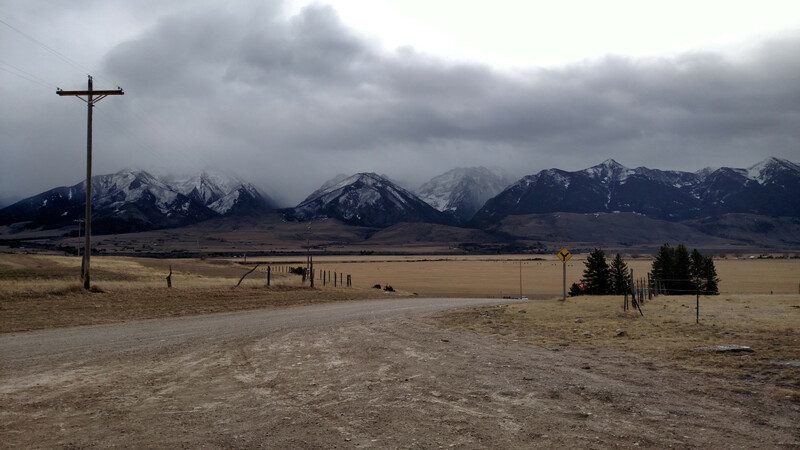 Spring brings such dynamic weather to Montana and I love it! 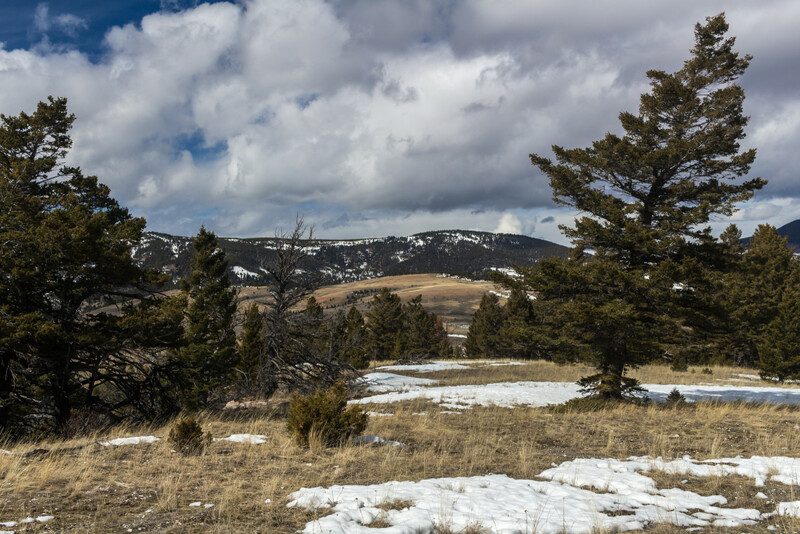 The trail offers an excellent view of West Pine to the southwest as well; a killer hiking area unbeknownst to most people. 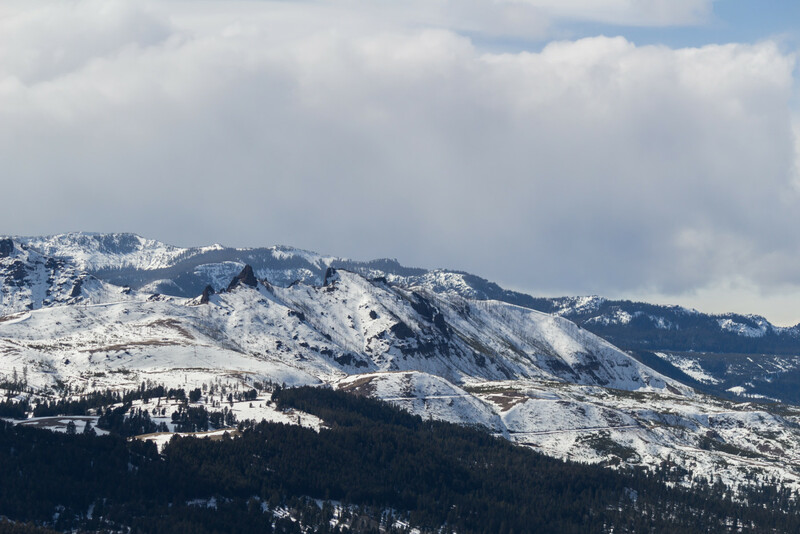 Chimney Rock is also visible just north of West Pine. I attempted to make it there once but private property prevents access to it, at least from the south. Things got blustery for a bit. West Pine in the background. West Pine after the storm passed. Chimney Rock to the right (barely visible). Finally at about 4 miles in we reached the approximate end of the ridge. 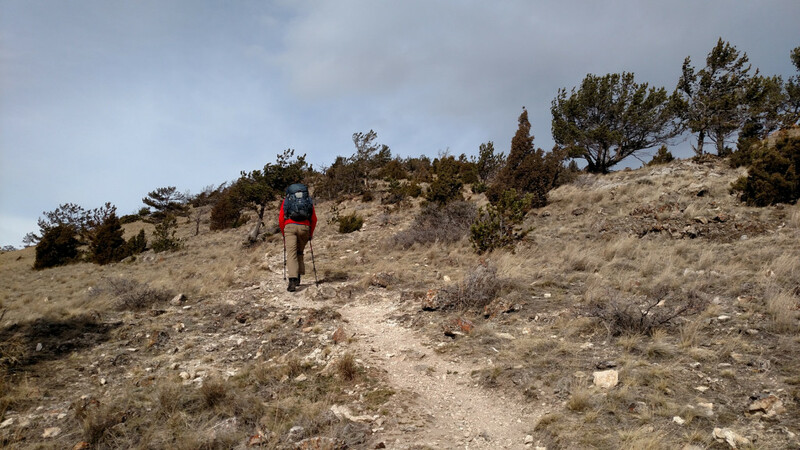 The trail abruptly ends and the ridge descends towards the valley floor. By this time most of the storms had dissipated and the sun was shining brightly overhead. We took refuge from the wind behind some brush for a quick snack break before for the return journey. 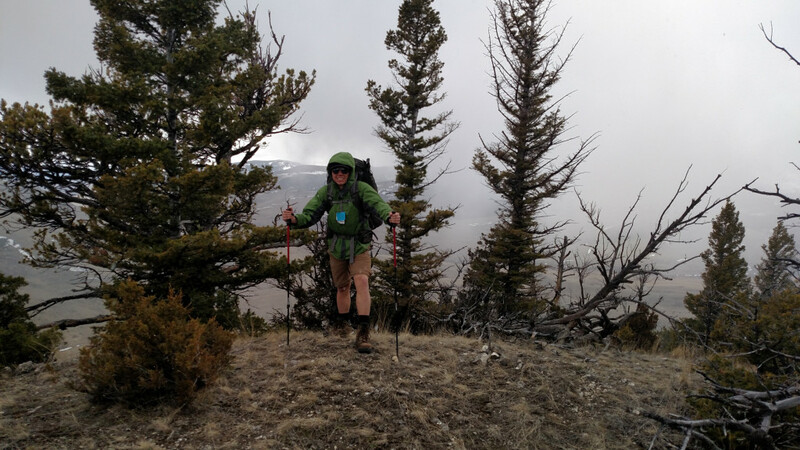 I’ve heard rumors that you can actually descend the south flank of the ridge and connect up with Divide Road but I’m not familiar enough with the private property boundaries to say if this is advisable. It was level at times. Nearing the western end. There was only a few patches of snow here and there. End of the line. Maybe it’s possible to go further, but it was a good spot to turn around anyway. Pine Mountain to the right. The return was quick and painless for the most part. The unnecessarily slow-going dip section got a bit tiresome but the extra daylight was invigorating and in less than two hours we were back down to the car. I was very satisfied with the outcome of the day. 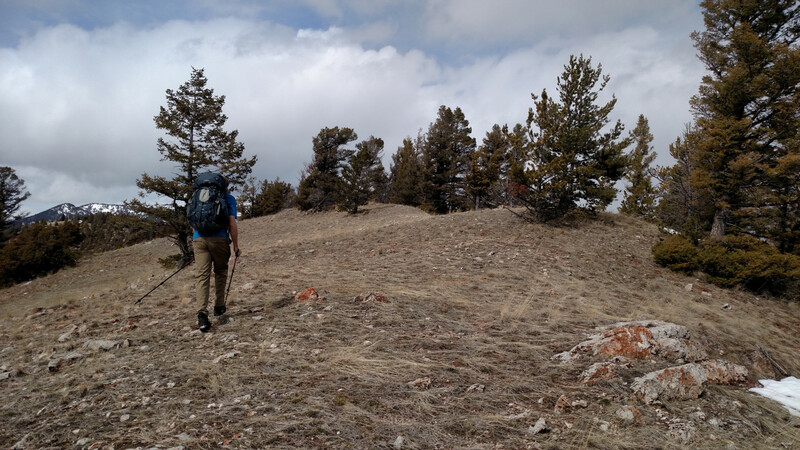 The Hogback far exceeded expectations and it was great to be able to add another reliable springtime destination to the arsenal of adventures. Awesome view of the Absoraka’s. The unnecessarily slow-going dip section. Nice picnic area relatively close to the trailhead. Back at the trailhead. The wind was just thrashing that thing.